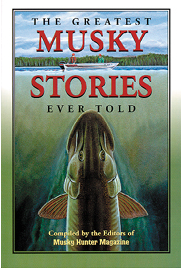 “The Greatest Musky Stories Ever Told” is a compliation of 30 of the most wild, wacky, funny, and unusual events that have occurred in the boats of guys who have spent their lives in pursuit of muskies. Giant muskies, multiple-fish days, colossal blunders, it’s all in this book! You won’t be able to put it down until you’re finished!